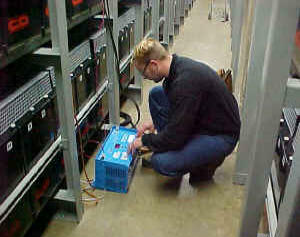 PSS are experts at maintaining battery systems. A properly maintained battery system is crucial in keeping critical systems on-line during utility power failures. Providing Maintenance on: • UPS Batteries • DC Power Plants • Solar Power Batteries • Sealed Battery Maintenance • Wet Cell Maintenance Services Performed: Quarterly Maintenance o Visually inspect each battery case, battery connection and battery rack. o Neutralizing and cleaning of cells and racks. o Verify proper electrolyte levels. o Record open circuit cell voltage. o Record specific gravity of any cell that exceeds the acceptable individual cell float voltage range. o Record AC Ripple Current. o Record battery charger voltage and current. o Record temperature readings of pilot cells. Semi - Annual Maintenance in addition to the quarterly maintenance o Perform internal resistance check of connections. Annual Maintenance in addition to the quarterly maintenance o Re-torque all inter-cell and inter-tier connections to manufacturers recommendations. Battery failure is the inability to supply sufficient power when you need it. When your UPS battery fails… your business goes down, you may damage valuable equipment…and lose data! PSS are experts at maintaining battery systems. A properly maintained battery system is crucial in keeping critical systems on-line during utility power failures. Providing Maintenance on: • UPS Batteries • DC Power Plants • Solar Power Batteries • Sealed Battery Maintenance • Wet Cell Maintenance Services Performed: Quarterly Maintenance o Visually inspect each battery case, battery connection and battery rack. o Neutralizing and cleaning of cells and racks. o Verify proper electrolyte levels. o Record open circuit cell voltage. o Record specific gravity of any cell that exceeds the acceptable individual cell float voltage range. o Record AC Ripple Current. o Record battery charger voltage and current. o Record temperature readings of pilot cells. Semi - Annual Maintenance in addition to the quarterly maintenance o Perform internal resistance check of connections. Annual Maintenance in addition to the quarterly maintenance o Re-torque all inter-cell and inter- tier connections to manufacturers recommendations.